Sometimes a project just has a way of coming together and the superb new album from Seth Lakeman is a case in point. When Seth met Wildwood Kin at a charity event he was struck by the ability of the trio (sisters Emillie and Beth Key and their cousin Meghann Loney) to effortlessly create harmonies. One roughly recorded demo on a mobile phone of Seth and the girls singing together enticed famed producer Ethan Johns (Ryan Adams, Kings Of Leon, Paul McCartney) to get involved and the result is a sublime combination of strident instrumentation and delicious vocal harmonies. The recording of the album took place in the Grand Hall of a Jacobean Manor House and the songs were cut ‘live’ to capture the acoustics of the location which proved a perfect fit. For a performer who started out in his kitchen and whose previous recording locations have included a church and, very oddly, a copper mine the Jacobean Manor House sounds like a step up. The songs themselves are a mix of seven new songs and interpretations of older material, which in some cases go back centuries, but the musical blend between the traditional songs and the newly written material is so seamless you’d honestly be hard pushed to tell them apart. Lakeman is equally comfortable with the 19th century moralistic song ‘Pulling Hard Against The Stream’ as he is turning his hand to, a very faithful, interpretation of ‘Anna Lee’ a Laurelyn Dossett composition that appeared on the 2007 album ‘Dirt Farmer’ by the late Levon Helm of The Band fame. ‘The Willow Tree’ opens the album and it is instantly apparent that the combination of Lakeman’s fine clear vibrato and mournful fiddle with the ethereal nature of the Wildwood Kin harmonies is a perfect match. ‘Meet Me In The Twilight’ has the trademark Lakeman stomp in abundance with a single drum on the chorus adding weight to the strident nature of the tenor guitar. Once again a great track is accentuated by the harmonies supporting a deep, clear Lakeman vocal. Those harmonies are especially noticeable on the arrangement of ‘Innocent Child’ where the harmony on the chorus might be considered a little corny (I’d prefer to call it playful and clever) but it just works so well and I absolutely love it. Seth Lakeman & Wildwood Kin by Matt Austin. The strength of ‘Ballads Of The Broken Few’ is in the combination of the performers and a very sympathetic production from Ethan Johns who recently claimed “The kind of record I like captures human performances” and it is this ability to capture the performances and the sparse instrumentation that imbues the album with a beguiling charm. This is very much a case of less-is-more. On the odd occasion that a little dirty guitar creeps into proceedings such as on the title track it’s the unexpected nature of the intrusion that works so well. On an album with more than a few highlights the stunning ‘Fading Sound’ with references to red dust and the front porch transports us to the bluesy heart of middle America before ‘Whenever I’m Home’ brings us back to more familiar Devon ground and emphasises the range and breadth of material here. 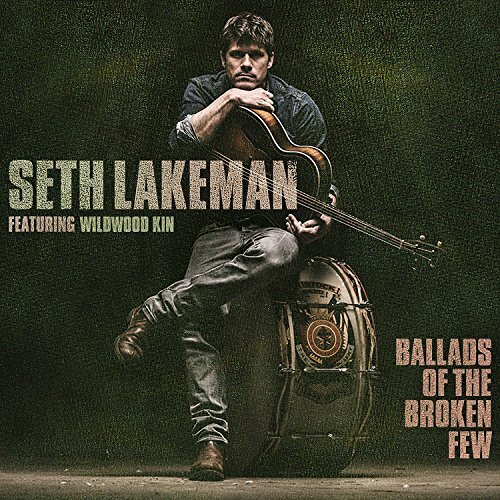 ‘Ballads Of The Broken Few’ finds Seth Lakeman willing to push his musical boundaries and work with new artists (Wildwood Kin are very much one to watch) and refreshingly there are no egos at work here, it really is all about the songs and the performances that are required to bring the songs to life. The stripped back and occasionally harsh nature of the performances and the songs makes ‘Ballads Of The Broken Few’ such an impressive, interesting and highly successful collaborative release.